Affiliations: Captain of the Royal Guards, unidentified assassins and henchmen, her girls of the Palace of Pleasure. Powers/Abilities: X'arthalla had magic powers enabling her to take the form of any woman, man, or child she wanted. It is unknown if it was just an illusion or if she had shape-shifting powers. She could project illusions. She also had good hypnotic powers. She probably could teleport herself over short distances, appearing in a cloud of smoke. (Savage Sword of Conan#81) - Madame X'arthalla led the famous Palace of Pleasure in Shadizar. Tens of girls and men were her "employees," and a lot of men of the nobility, and rich and important people were clients of the Palace. The specialty of Madame X'arthalla was to change her shape to become exactly like the woman desired by the client. X'arthalla's employees satisfied the most deep desires of their clients, also performing a play and acting in fictional sceneries. Conan the Cimmerian was about 17 years old when he met Nadia, one of the girls of the Palace, and he visited the Palace of Pleasure and saw Madame X'arthalla. Madame X'arthalla wanted to rule Zamora and, with the Captain of the Guards plotted a plan to kill the King of Zamora. During a hunt, X'arthalla created the illusion of Satrina, the dead wife of the King of Zamora, and attracted him on the top of a cliff. Conan managed to follow the King and to save him before he jumped from the hill to follow the illusion of her wife. That night X'arthalla took the form of a young beautiful woman, hypnotized Conan and sent him to kill the King. But just before slaying the King, Conan reacquired his will. However, the King believed him to be an assassin and had Conan imprisoned. Conan was put in the Cage of Death, used in Zamora to execute the potential murderers of Kings. But he survived the execution attempt. Meanwhile Madame X'arthalla had attracted the nobles of Zamora, and the King, too, to assassinate them all in the Palace. Conan succeeded in reaching the Palace of Pleasure just in time, and he freed the the Chamberlain, the Chancellor, the Minister of Protocol and killed many of the assassins. When Conan saved the King, Madame X'arthalla appeared. She tried to hypnotize the barbarian again, but he resisted. Then she tried to move him to pity using the form of a child, then, of a beautiful woman. Then she transformed into Conan's mother, getting the effect she wanted: Conan was stunned. A knife appeared in X'arthalla's hand, but Nadia stabbed X'arthalla just in time to save Conan. X''arthalla died and reacquired her true form. Comments: Created by Roy Thomas (writer), John Buscema (pencils) and Ernie Chan (inks). Once, Conan called her "mutant". It is possible that he used that word with a disparaging meaning, and not to state that she was a "Homo Superior". The word "mutant" could also be referred to the ability to "mutate" form. 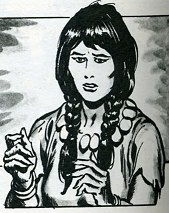 Conan's mother is depicted like an American-Indian woman. 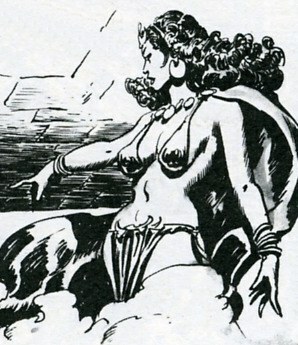 John Buscema also depicted Picts in such manner. or any other characters with a similar name.